I’ve said it before and I’ll say it again. Spring is my favourite season. I love the weather – warm but not too hot days and nights where you don’t have to kick off the doona. And I love the “newness” of the season. It’s this newness that always inspires me to change things up. Your wardrobe is an obvious place where change can occur to your style but perhaps maybe not so obvious is how you can change your hair. I’m not necessarily talking radical change here (although don’t let me stop you if that’s what you have in mind for your hair this season). No, I’m talking little tweaks to the way we get our hair cut and coloured or maybe how we care for our hair in between cuts and colours. It’s those little tweaks that can lift and freshen your whole face and lift your mood. 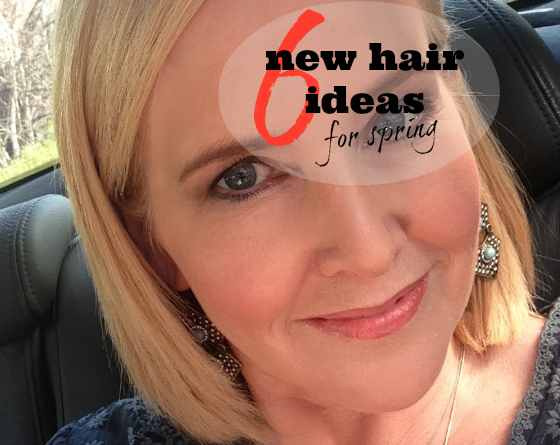 To find out more about my six new hair ideas for spring, check out my post on the Schwarzkopf Style Studio blog. Are you planning any changes to your hair this spring? Checking out the post before heading to hairdresser for some colour… and to book a cut as my hair looks dreadful. Wanted it long but I never do anything with it, time for a change. Oh good luck with that change Seana! Hi Nikki, great post, thanks! I love a good pre-spring hair change. I’ve just had my medium hair all cut off into a choppy razored look – not quite sure how best to describe it without sounding like it’s mullet-ish…my (wonderful) hairdresser was keen to reassure me it isn’t! I wash it every 3 days (at night) and have become a convert of the wonderful invention of dry shampoo – whoever thought that one up deserves a round of applause. When I do wash it though, I keep forgetting to use less shampoo and end up with suds galore. RosyPink, I suspect it was a woman who invented dry shampoo!! Ha, I was one of those people who used to have a fringe perm! It was great at the time but hard to believe now! These days I only wash my hair every 3rd day, a once unthinkable idea! I do have a fringe and it has gradually gone from feathery in past years to heavier but I really struggle not to sweep it away to the side. I have blonde highlights and have reduced it to one colour now that I am greyer but am torn about the colour. Not easy to work out the best for my colouring as a blue eyed ,once was brunette. I live in Brisbane so if anybody has a suggestion about where to find a colour guru, I would be eternally grateful. I wouldn’t even know how to go about finding a person who is really good at knowing what suits a person. Nikki, I’m getting a Bad Gateway message when I try to click through on the iPad. Hi Thea, I’m sorry that’s happening for you. I just tried on my ipad and computer and it clicks through ok. I am considering a new colour but then the thought of maintaining the growth deters me. Can I say that I am finding the new layout really confusing. I can’t see what the new story is and the top bit is too cluttered. Sorry for the negativity but I read every day and the past two days I’ve clicked away as I couldn’t see the ‘new’ story. Thanks for your feedback. If you’re arriving on my home page, then the new story is always top left under What’s New. Sorry that it’s confusing for you. Great hair tips there Nikki ,Yep I have a 6 weekly appointment with my hairdresser and we are on very good terms she understands my fine hair which I always walk out swishing my hair which makes me happy.I also have cut down on the washing of it as I get older I only wash it 3 times a week,which is great as I used to wash it everyday a few years ago!I used to have a fringe but being so fine it was hard to manage,i love the idea but don’t think I could do it ,it takes me ages to grow it out. I used to wash mine every day too! Glad your hairdresser understands your hair. Thanks Kymmie … cutting if all off is not something I’ve done for a long time – think GP’s Sliding Doors hair style in the late 1990s!